Trace (sic) Ullman is an awarded television, film and stage actress, comedian, singer and dancer born on 30th December 1959, in Slough, Buckinghamshire, UK. She is probably best remembered for starring in “The Tracey Ullman Show”, her own TV comedy series from 1987 to 1990, and later producing several programs for HBO, including the multiple award-winning “Tracey Takes On…”. Her other notable shows include the sketch comedy series “Tracey Ullman’s State of the Union”. Ullman holds the title of the richest British female comedian and second richest British actress. Have you ever wondered how rich Tracey Ullman is, as of early 2017? According to sources, it has been estimated that Tracey Ullman’s net worth is over $115 million, accumulated through an extraordinarily successful and lucrative career in the entertainment industry, which has spanned more than 35 years. Since she is still very active in all of her career fields, her net worth continues to grow. Her father passed away when she was only six years old. After that loss she moved around a lot with her mother, who changed several jobs to support Ullman and her sister. Tracey started performing while still a child; at the age of twelve, Tracey won a scholarship to a performing arts school but four years later decided to leave school in order to pursue a dancing career in Berlin. Later, when she returned to England, she had minor success in musicals in London’s West End. In 1981 she went on to British TV projects such as the comedy skit show “Three of a Kind”. While still experimenting in multiple fields of her career, Tracey released a rock-influenced album “You Broke My Heart in 17 Places” in 1983, which achieved some success in England, most notably the song “They Don’t Know” which became a crossover hit in the US a year later. After auditioning in the US, Ullman appeared in the 1985 drama “Plenty”, alongside Meryl Streep, and worked with producer James L.Brooks on starting her own comedy series “The Tracey Ullman Show”. The program debuted in 1987, and featured Ullman in a broad range of characters, including short animated parts by Matt Groening which were the beginnings of “The Simpsons”. 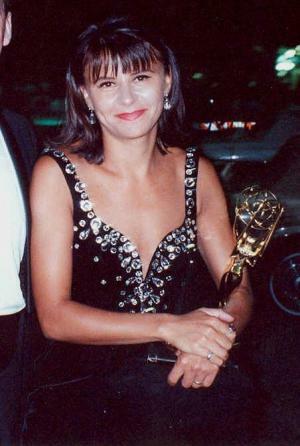 After premiering, “The Tracey Ullman Show” gathered more and more popularity, eventually earning several Emmy Awards, including for outstanding variety music or comedy series in 1989. Her net worth was well established. After the show ended in 1990, Tracey focused on films, and some of her notable roles include those in “Robin Hood: Men in Tights”(1993), “Household Saints”(1993) and “Bullets Over Broadway”(1994). Ullman eventually decided to return to television, and earned numerous acknowledgements for her 1993 HBO special “Tracey Takes On New York”, which then inspired her next show “Tracey Takes On”, debuting in 1996. Another one of her popular shows was the 2008 “State of the Union”, which was inspired by Ullman becoming a naturalized US citizen. Some of her more recent activities include a part in the 2014 film adaptation of “Into the Woods” musical, and the debut of BBC’s “The Tracey Ullman Show” in 2016. Privately, Ullman married producer Allan McKeown in 1983, with whom she has two children. Unfortunately, in 2013 Tracey’s husband died of prostate cancer. 1 A lot of stand-up comedy is embarrassing: too many idiots doing it in orange neckties against brick walls. I find most sitcoms embarrassing too, because they seem so forced. 2 Chic is the character my family least likes to see me as. It is the most uncomfortable make-up. The beard is vile. It's made of yak hair and itches horribly. 3 As you get older, you realize it's work. It's that fine line between love and companionship. But passionate love? I'd love to know how to make that last. 4 As I get older, I just prefer to knit. 5 After spending two months in France where the air is great, I genuinely noticed how ill I felt returning to Los Angeles. The way we're going, if they keep building and building, there will be no space any more. 6 I'm not jealous over the success of The Simpsons (1989). Not at all. They used to appear for 30 seconds in the middle of my show. Maybe they'll let me appear for 30 seconds in the middle of their show. 1 Her father was Polish and her mother was English. Her father was in the Polish Army during World War II. 2 On the radio program "Fresh Air with Terry Gross," she said that when she was six years old, her father died of a heart attack while reading a book to her. 3 Is the first foreign comedienne to successfully crossover to American television audiences. 4 Became an American citizen in 2006. Ullman told interviewer Terry Gross that the hardest part of becoming a citizen was that after the induction, they were all forced to listen to the Lee Greenwood song "Proud to be an American". 5 Has been able to perform in black-face on her show, Tracey Takes On... (1996), without any controversy. 6 Son, John Albert Victor McKeown (John McKeown) (born August 6, 1991) and daughter, Mabel Ellen McKeown (Mabel McKeown) (born April 1, 1986). 7 Has homes in England and Los Angeles. 8 According to the British press, she and her husband Allan McKeown have a net worth of between $50-100 million. 9 After appearing in his film Give My Regards to Broad Street (1984), Paul McCartney returned the favor by appearing at the very end of her video for the hit song "They Don't Know". He played a character named Paul. 10 She was awarded the 1981 London Critics Circle Theatre Award (Drama Theatre Award) for Most Promising New Actress of 1980 for her performance in Four in a Million. 12 Announced that she was performing at a tribute concert for the late singer-songwriter Kirsty MacColl. It was MacColl who wrote Ullman's 1983 hit song, "They Don't Know." 13 Ended her American TV shows by telling the audience to "Go Home." 14 The phenomenally successful animated series The Simpsons (1989) is actually a spin-off of The Tracey Ullman Show (1987). The animated show began as 30 second segments aired between comedy sketches. In 1992, she filed a lawsuit asking for a share of the merchandise related profit from "The Simpsons". The lawsuit was unsuccessful. 15 Once played Frenchy in a London stage production of "Grease". She also played a character named Frenchy in Small Time Crooks (2000). 16 Hit the Billboard top 100 twice in 1984 with 'They Don't Know' (US #8) and 'Breakaway' (US #70). Both singles also peaked at #2 and #4 respectively in the UK in 1983. Also had 3 further UK top hits with 'Move Over Darling' (UK #8) in 1983 and 'My Guy' (UK #23) and 'Sunglasses' (UK #18) in 1984. She also claims her original record company, Stiff Records, "stiffed" her by not paying her proper royalties. 17 Dropped out of high school. Into the Woods 2014 performer: "Prologue: Into the Woods"
Our Nixon 2013 Documentary performer: "They Don't Know About Us"
If It Ain't Stiff 2007 TV Movie documentary performer: "Breakaway", "They Don't Know"
Once Upon a Mattress 2005 TV Movie performer: "SHY", "THE SWAMPS OF HOME", "SPANISH PANIC", "Happily Ever After"
Corpse Bride 2005 performer: "According to Plan"
Tracey Ullman: A Class Act 1993 TV Movie performer: "I Am What I Am"
Happily Ever After 1990 performer: "Thunderella's Song"
Girls on Top 1985 TV Series performer: "Girls on Top"
Who is Tracey Ullman, what is her Breaks The News series and what are her best impressions? Who is Tracey Ullman, what’s her Breaks The News show and what are her best impressions?